The Toolbar tab allows you to configure what tools appear in the toolbar. Add Tool adds the currently selected tool in the explorer at left to the end of the toolbar. Add Separator adds a separator to the end of the toolbar. Move Up moves the currently selected item of the toolbar up/left one spot. Move Down moves the currently selected item of the toolbar down/right one spot. Remove removes the currently selected item from the toolbar. Location configures the location of the toolbar within the overall window. The toolbar may be placed on any of the window's four borders, described as north, south, east, and west. It may also be hidden, or it can be placed "down the middle" - that is, to the left of the canvas but to the right of the explorer pane and attribute table. 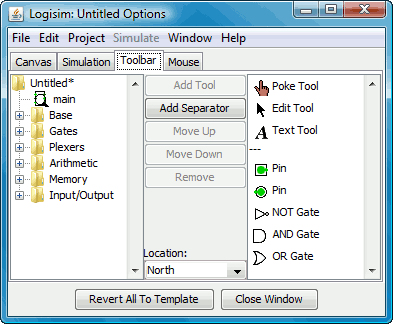 The attributes associated with the tools are not displayed in this window; instead, you can view and edit them within the main drawing window.